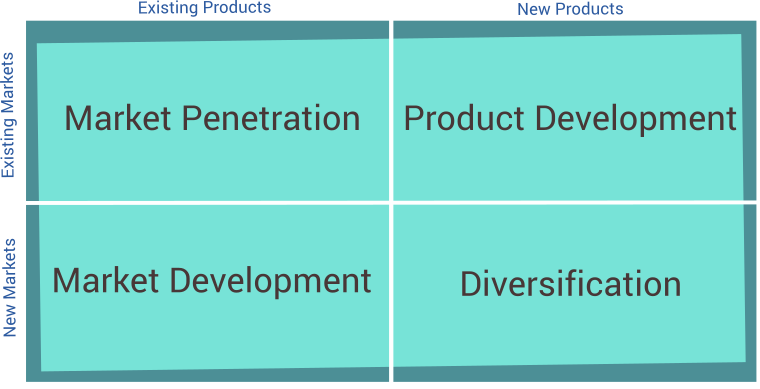 The Ansoff Matrix, developed by Igor Ansoff is a planning tool that can is used to help a business to determine what strategy the business uses by using the quadrants to determine how best to grow organically. ‘Existing’ categories often carry lesser risk than the ‘New’ categories as they will likely require greater capital investment for example. Market Penetration is the least risky option in most cases because it most likely does not require much more than the other categories, This can be used when a business would like to expand whilst minimising the risk involved. The aim is to target existing customers and sell more existing products through things like promotion and marketing. If the product is successful then the business may sell more products to existing markets by opening new stores, an online shop or making their appearance more apparent by opening more outlets in an area. Using this method business can better calculate what their customers want based on past sales data from other locations within the market. Product Development is much more resource intensive as it will require innovation and the cost in terms or research and development associated with it will be much greater. However, it will most likely mean that the business has the first-mover advantage and can market its products to existing markets. This, however, could have its downfall as there is most likely greater loss if it does not work out, this can also be problematic as it is sometimes the strategy that failing business model companies undertake. It also may become exhaustive if products are not innovative enough to maintain customer numbers. Market Development is where a business changes its market strategy to bring its existing products to new markets, this could be through opening new stores abroad or far away from its domestic market. This could also be through e-commerce, by changing pricing, by changing quality or even changing its brand to localise the products it sells in an area or country. A business may diversify its products or brand in order to open up to new markets and new products, this may be organically by opening a new type of store or buying out another, Or changing its entire product range, an example of this would be new ‘vape’ shops opening as they respond to the death of the cigarette market as smoking becomes a social taboo.